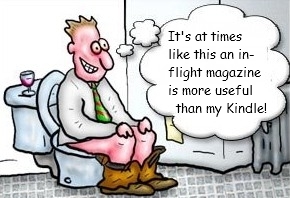 I’m a frequent flyer, and as a consequence of international aviation law and my lily-livered British tendency to comply with silly rules, I tend to browse through the in-flight magazine until the seatbelt sign goes out. I’d love to know the real reason why I am forbidden from reading my Kindle, but that’s another story. Anyway, that’s why I came across an astonishing example of corporate puffery this evening. You know the stuff. Bland and meaningless tosh used by corporate communicators the world over to fill a bit of space when they have nothing really to say. He then moves on, swiftly changing the subject, leaving me in such a state that I felt compelled to whip out my laptop and write my first ever airborne blog. Quite how the intention to announce news of news next year can constitute news today is beyond me. But what is worse – corporate puff or marketing bull?